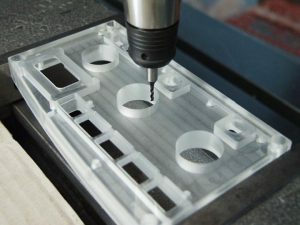 CNC plastic machining uses the latest computer numerical control techniques. The milling machines used are thus automated and controlled by a computer to machine a block of material to create a part. The absence of a mould reduces the cost and time, and makes it possible to obtain identical parts made from the right material. This makes it the method of choice for unit productions, for example for visual and functional tests. CNC machining uses a machining technique that was developed in the 18th Century. In fact, the first ‘turning machine with a metal frame’ was invented in 1751, the first of a long series of machines aiming to create more precise operations mechanically than are possible by handcrafted techniques. This marked the beginning of industrialisation. However, it was not until the Cold War that the development of automation was addressed. At that time, the company Parsons Works was commissioned by the U.S. Navy to increase the productivity of its production line for helicopter blades. John T. Parsons then motorised the axes of the machines for making these blades. Working with IBM, he studied the possibilities of controlling these machines by computer. This was the starting point of the CNC machining method. In 1952, Richard Kegg, in collaboration with MIT, developed the first CNC milling machine: the Cincinnati Milacron Hydrotel. Five years later, in 1958, he filed a patent for a “Motor Controlled Apparatus for Positioning Machine Tool”. This was the commercial birth of this technology. With plastic CNC machining, the machining function is determined by a program which controls the movements of tools on the block to be machined. It defines the axis of rotation of the milling cutter during milling and the axis of rotation of the part during turning. The machine, a milling machine with three or five axes, is fully automated and controlled by computer. The 3D file entered in the computer indicates the route of the milling cutter, which cuts the desired part from the block. This is why this technique is one of the so-called “subtractive” methods, which is rapid and inexpensive for a production of one to ten parts. However, since the economies of scale are small, this technique is not recommended for medium and large series. It is suited to productions of up to ten parts for visual and functional tests, because the parts are identical and produced with the right material. Many finishes are also possible.